We’d love your help. Let us know what’s wrong with this preview of The Black Orchid by Celine Jeanjean. A man drained of blood. The greatest challenge Rory and Longinus have ever faced. Longinus is besides himself. Someone has bought all the black silk in Damsport, so he has to make do with grey. Unacceptable, given that an assassin in grey is as ridiculous as a bulldog in culottes. Conspiracies don’t get more dire than this. Of course, there’s also the fa A man drained of blood. Of course, there’s also the fact that Rory’s oldest friend has been found drained of his blood. And that clues seem to indicate that Myran has returned just as an important diplomat visits Damsport. Those clues take Rory and Longinus to a new brothel in town called the Black Orchid. That it’s decked in black silk proves that something nefarious is going on. That its clientele tends to disappear is mere confirmation of that fact. To ask other readers questions about The Black Orchid, please sign up. Hands down my favorite part of these books is the ch Reviewing a sequel is always a little bit challenging. I’ve begun to think of it as advice on if it’s worth it to start reading the first book of the series. For some reason I’ve been finding it difficult to put my thoughts into words about this book beyond, “It’s awesome, go read it.” Maybe because it feels like I’ve already written pretty much everything I want to in my review for the first book in the series, The Bloodless Assassin (previously titled The Viper and the Urchin). All the wonderful things in that book definitely apply here. Honestly, I really didn’t have that many expectations for The Black Orchid other than more Rory and Longinus goo For some reason I’ve been finding it difficult to put my thoughts into words about this book beyond, “It’s awesome, go read it.” Maybe because it feels like I’ve already written pretty much everything I want to in my review for the first book in the series, The Bloodless Assassin (previously titled The Viper and the Urchin). All the wonderful things in that book definitely apply here. Honestly, I really didn’t have that many expectations for The Black Orchid other than more Rory and Longinus goodness. And this book delivered on that. It delivered big time. For me, this series of books is all about the characters. I care about them in a way that few books can get me to care about fictional creations. And it’s hard to pinpoint why, exactly. I think it’s a combination of unique believability—all the characters are very different from each other—and just the right blend of witty snarkiness to emotional vulnerability. Honestly, the plot (and it’s a good one) is just a glorious bonus that allows me to spend more time with these wonderfully quirky people and their misadventures. I can’t wait to see what trouble they get into next, and I can’t wait to go along for the ride. The second book in The Viper and the Urchin trilogy picks up where the first left off. At the beginning of the story, Rosy and Longinus are in the service of the Marchioness, in theory ready to help her against her enemies, but practically sitting around waiting for something to happen. When something does happen, it doesn’t come from the Marchioness. Rory accidentally learns of people turning up exanguineted in the streets, and a few of them are her former friends. She needs to know what happen The second book in The Viper and the Urchin trilogy picks up where the first left off. At the beginning of the story, Rosy and Longinus are in the service of the Marchioness, in theory ready to help her against her enemies, but practically sitting around waiting for something to happen. When something does happen, it doesn’t come from the Marchioness. Rory accidentally learns of people turning up exanguineted in the streets, and a few of them are her former friends. She needs to know what happened to them and Longinus also wants to know what happened, since the murder is using one of his potions. It would look like they have the same purpose in mind. In fact, they progressively get far away from each other, especially because Rory, thrown in the shining life of the Marchioness’s palace, ends up fighting to remain herself in a moment when she, her body and her minds are deeply changing. On the surface, The Black Orchid is a mystery with very definite political plots woven into it, but at its very heart it is the coming-of-age story of a girl that finds herself in a place that might not be hers, no matter how charming it looks. I enjoyed both sides of the story very much, though Rory coming-of-age was particularly endearing. She’s a very human character, with a lot of flaws and a lot of qualities that get very mixed up during this story. Damsport becomes even more vivid as a city in this novel. The places, the picturesque people, the history. And it’s quite clear that a plot is boiling in the shadows and I can’t wait to see what it is. I have to confess I loved this book even more than I did the first. Can’t wait for the final one to come out. (Thank you to Celine Jeanjean for providing me with a free copy of this book in exchange for a review). After having such a bad experience with the last book I read, I was so glad that I had a copy of the Black Orchid on my Kindle that I could move straight onto. I knew that being back with Rory and Longinus would bring a smile to my face, and I was not disappointed. This book picks up a couple of months after the first book. Rory and Longinus are now in the Marchioness’ employ, though so far, she hasn’t had them do anything. When she asks them to investigate the death of man in the Rookery, found exsanguinated, their digging leads them a new brothel, The Black Orchid, and a smuggling ring whose existence makes no sense. When they are framed for the death of an important diplomat’s bodyguard, the race is on to find out exactly who is behind the mysterious disappearances and deaths, before they both end up in prison. Once again, I can’t decide whether it’s the characters or the world-building that are the highlight. Both are so well-drawn. . Longinus needs all the hugs; while is coping with his most recent confrontation with his sister, Myran, his issues aren’t entirely gone, and there are times in this book when Rory unintentionally exacerbates them (hence him needing the hugs). I really loved the little detail of him saying Myran’s name a few times every day, to ensure his stutter is kept in check. Rory is torn between wanting to make something of herself and leaving behind her urchin identity, which is the only identity she’s ever known. This is partially due to Rafe, who also makes some more appearances in this one, and is now firmly established as Rory’s love interest. We learned a few things about him in this book, too, and I look forward to that being explored further. And I have to say, I love Damsport. We got to see a few more of the districts within this thriving city, and learned more about how it operates. Jeanjean’s descriptions are wonderful; I want to run along the rooftops with Rory or drink butterscotch coffee in Susie’s Coffeehouse with Longinus. Even though I’m a complete klutz who would slip on the first uneven tile and I generally don’t drink coffee at all, I still want to. The whole place is just cozy and comforting to read about, even with the rough around the edges aspects. In the next book, our favourite characters are going to be traveling out of Damsport, and I can’t wait to see what locations they visit and how those are brought to life. As I read The Black Orchid, Book 2 of Celine Jeanjean’s The Viper and the Urchin Series, I was thinking again about those three sliding variants of character development—competence, proactivity, and sympathy. In my review of her first book, The Bloodless Assassin (formerly titled The Viper and the Urchin), I talked about how those markers moved over the course of the book. It was fascinating to see how they move again in the sequel. The motivating premise of the first book was, as its new title c As I read The Black Orchid, Book 2 of Celine Jeanjean’s The Viper and the Urchin Series, I was thinking again about those three sliding variants of character development—competence, proactivity, and sympathy. In my review of her first book, The Bloodless Assassin (formerly titled The Viper and the Urchin), I talked about how those markers moved over the course of the book. It was fascinating to see how they move again in the sequel. The motivating premise of the first book was, as its new title correctly proclaims, the anomaly of a master assassin who is reduced to physical incapacity by the sight of blood. But in this new book, would that be enough to continue moving the action forward? Not a problem! Working brilliantly within a mix of my favorite genres (steampunk/sword & sorcery fantasy), author Celine Jeanjean continues to move those sliders as both urchin Rory and assassin Longinus develop their relationship with each other and with others. As The Black Orchid opens—to their mutual shock and not a little embarrassment— both Rory and Longinus find themselves in the position of being honestly employed in the service of Damsport’s ruler, the Old Girl. It’s devastating to both. Longinus—"Damsport’s most elegant assassin", clotheshorse, and bad poet—is used to stalking his contracted victims to the accompaniment of an internal monologue extolling his brilliant (and brilliantly accessorized) successes. But with legal employment, he’s reduced to stalking incoming shipments to discover the reasons for the shortage of luxury goods such as his trademark black silk (so essential to the Viper’s image you know…). And the elegant lines he formerly composed in praise of his prowess as an assassin are now replaced with love poems sent (anonymously, of course) to the Lady Martha, daughter of the Old Girl. While our sympathy for this new Longinus might be high, his rapidly diminishing competence and proactivity make him seem like an over-age and slightly whiny Harry Potter. Well-dressed and no longer a scrawny, smelly urchin, gainful employment and regular meals have hit Rory hard as well. For the first time, her life plan of becoming a master swordswoman is tainted by the realization that “the Scarred Woman” she wanted to emulate for years is actively determined to destroy both Longinus personally and her city of Damsport. But Rory slowly realizes that if she’s no longer an urchin—the one thing she was supremely competent at—then she has no idea who or what she is. Like Longinus, the Rory we meet at the beginning of The Black Orchid is hitting the trifecta of low sympathy, competence, and proactivity. And the relationship between Rory and Longinus—the one area that could move those sliders up as they reinforce each other’s strengths and compensate for their weaknesses—is crumbling under the weight of respectability. Luckily for Rory and Longinus, the one person whose sliders are at 100% for competency and proactivity, and near-zero for sympathy—Longinus lifelong enemy and sister Myran—is subtly orchestrating a series of events designed to destroy them. With their enemies a step ahead at every turn, Rory and Longinus both have to step out of their comfortably respectable new life, become proactive, and resurrect the competencies of their old lives to survive. One of the things I love about Celine Jeanjean’s writing is all the stuff she does NOT say. In keeping faith with Rory and Longinus as narrators, she keeps explanations to a minimum and pays readers the compliment of assuming we’ll get relationships and motivations from actions, instead of from paragraphs of exposition. Instead of congratulating Damsport on having people of color—and especially women—be strong, clever, and brave, the author lets the unfolding story speak for itself. The love of a woman’s life? It can be another woman, one of a different race at that, and that relationship can be publicly acknowledged. The strongest person in town? Again, that can be a woman. The villain? Ditto. 1. Both the Black Moment when all goes to crap AND the turning point for the series overall? I don’t want to risk spoilers, but there is a moment when all truly seems lost, and when Rory and Longinus’ relationship is severed. Coming off that moment is, I believe, the real turning point for the series as a whole. 3. Characters who grow and develop within this book AND also have arcs that span all the books? Rory and Longinus meet this requirement individually, but even more in the form of their evolving and developing relationship. Five stars? When a book has everything I like—diverse, well-developed and evolving characters, a steampunk setting, and entertaining dialog, what’s not to love? I fell in love with Rory and Longinus and the city of Damsport when I read The Bloodless Assassin last fall. So, when I learned the book I read was only the first book of a steampunk series, book 2 (which did not yet have a name) became one of the most anticipated new books of 2016 for me. From the first word on page one to the last word on the final page, The Black Orchid met all of my expectations! The continuing adventures of the assassin that cannot stand the sight of blood and the grammatica I fell in love with Rory and Longinus and the city of Damsport when I read The Bloodless Assassin last fall. So, when I learned the book I read was only the first book of a steampunk series, book 2 (which did not yet have a name) became one of the most anticipated new books of 2016 for me. From the first word on page one to the last word on the final page, The Black Orchid met all of my expectations! The continuing adventures of the assassin that cannot stand the sight of blood and the grammatically incorrect urchin who insists she is nobody’s assistant are highly entertaining. Like the first book, this sequel has engaging characters and an intriguing plot. It all happens in a city that is vividly detailed, Crayola-box-64-colorful and full of possibilities! In The Black Orchid, urchin Rory becomes a little less urchin-like. Much to her insistence to the contrary. The question of her age was answered – sort of . She may pretend to be 16, but she is not that young. She suspects she is 18, but may be even older. Rory is no longer a child and in her position working for the Marchioness of Damsport, away from her childhood home in the Rookery, Rory is maturing faster than she would like. Rory’s struggle to hold on to her heritage and maintain her urchin life-style is poignant, commendable and entertaining. I love the scenes where, in the course of her grownup job working for the Marchioness, urchin Rory is tearing through Damsport either on the back of a powerful mechanical spider or on her feet. Running and jumping across rooftops and scampering up and down gutters, Rory needs no steam coaches or steam rickshaws to get herself from place to place. Longinus is the assassin who cannot abide the sight or smell of blood. It would seem a serious handicap for an assassin, but he has other talents that aid him in his profession. In The Black Orchid, his ability with a sword, skill as an alchemist and his heightened sense of fashion are critical to Longinus’ work for The Old Girl (the Marchioness). Longinus’ quirks have endeared him to me despite the fact that he is vain, arrogant and often totally clueless when it comes to understanding Rory. “Why’s he staring at me like that?” asked Adelma. “Longinus,” hissed Rory, elbowing him. “Forgive me,” replied Longinus with an apologetic incline of the head. “I was just absolutely mesmerised by the brutishness of your features.” At his side, Rory squeaked. Rory is scampering across rooftops and Longinus is hanging out in the Rookery because there is a mystery to solve. A mystery that started with the mysterious death of Rory’s friend and may have far reaching consequences. Because the Old Girl’s dear friend and former lover Mizria is visiting Damsport, the Marchioness wants the murder solved soon to keep everyone safe and the political situation status quo. Since the body was found in the Rookery, she calls on Rory to visit the old neighborhood and dig into the mystery. It is going to get a lot more complicated than the death of one Rookery citizen and Rory and Longinus will be in the thick of it. There are plots and there are plots within plots. The mystery is complex and dark with more than enough intrigue. The intrigue was doled out in small bites throughout the book, so don’t think you are going to figure this one out very fast. Just the way I like it! Ms. Jeanjean’s imagination set to words has made her a favorite author for me. I love her descriptions of, well, everything. From Longinus apparel to the automated library book retrieval system, I am able to form very vivid pictures in my own mind about what the city of Damsport and her people look, feel, hear and smell like. In one passage in particular, I was mesmerized by the description of the Damsport docks, the people and all the activity occurring there. The Black Orchid is steampunk with only the slightest bit of romance. Book one had only a hint. In book 2, the hint grew two a realization. My hope is that as the as the adventures continue, so will the romance. That bit of romance is happening between Rory and Rafe. Rafe is one of the Varanguard – the Old Girl’s personal bodyguards – and he is often assigned to duties that involve Rory. He pretends that he is only doing his job. She pretends to detest him. It doesn’t help that Rafe is of the nobility. When Rory insists she is nobody, Rafe response is sweet and very romantic. “You’re somebody to me”. Witty banter between Rory and Rafe is as entertaining as it is enlightening. They have the same number of letters in their names – does that mean they are meant for each other? The Urchin and the Lord. Hmm, maybe that could be a future title. I can tell you that it looks like book 3 has them on a new assignment, leaving the city – together. The Black Orchid is highly recommended! For truly magnificent steampunk adventures, The Viper and the Urchin series is difficult to top. I an enamored of Ms. Jeanjean’s skill with words, so I’m going to end my post with a list of words or phrases that made me smile, say hmm, or look something up. Totally out of context, perhaps they will entice you to read The Black Orchid. Ms. Jeanjean provided a review copy in exchange for an honest review. Just reread this book having read the 3rd book of Slave City. I enjoyed it even more than when I first read it. Longinus and Rory work well as characters and I am completely emotionally invested in them as a result of the fantastic writing and world building. I highly recommend it. Men are vanishing and dying in the Rookery, and the Marchioness of Damsport finds herself suddenly (and astonishingly) in need of urchin Rory's connections to discover why and how her subjects are disappearing. Meanwhile, an even more sinister plot awakens as far as Longinus is concerned. For someone is trying to eliminate black silk from Damsian markets ... and how can Longinus maintain his reputation as the most elegant assassin in Damsport if he can't dress the part? A few of you may remember Men are vanishing and dying in the Rookery, and the Marchioness of Damsport finds herself suddenly (and astonishingly) in need of urchin Rory's connections to discover why and how her subjects are disappearing. A few of you may remember when I read The Viper and the Urchin last year. The title has since changed to The Bloodless Assassin (a fabulous title! ), but the story remains the same ... and The Black Orchid once again brings us back to the world of Rory and Longinus. At first glance, you'd think these two made an unlikely pair, but I absolutely love the dynamic duo. They are perfect foils for the other's personality, and I really enjoyed their growing friendship/alliance ... as well as the tumultuous moments introduced in this book. I simply adore Longinus, adore that he's equal parts pompous snob and brilliant assassin. I particularly enjoy how his intuition is almost always spot on ... but for all the wrong reasons. Not to give too much of a spoiler, but his missing black silk actually plays a huge part in solving the mystery. The author did a wonderful job of utilizing his unique personality to progress the plot and it never once felt forced or contrived. Also, I'm dying - literally dying - to have more of the romance hinted at in this book. I'm not going to say who, because I don't believe in spoilers, but ooohhh how I loved the romance. (There better be more in book three, Ms. Jeanjean! You hear me?! More romance! I need my urchin love story!!!) Again, there's only hints of romance (so far) so don't be put off if you're not into that sort of thing. There's plenty of mystery and action and humor to appease everyone. That brings me to my recommendation: read it. Everyone, just go pick up a copy and read it. The story stands quite well on its own, but you really should grab The Bloodless Assassin to go with it, so you can have an entire weekend of well-made sassy characters, sword-fighting action, blood-chilling assassinations, witty banter, and all the other amazing goodness to be found in this series. Our favorites are back again and things are not what they seem in Damsport. After suffering for months at the hands of boredom, Longinus and Rory find themselves thrust into a mystery that has something to do with missing men and lost black silk. With the life of a very important figure from the Marchioness' past are at stake, the Old Girl will do anything to make sure things are safe. Even if it puts Rory and Longinus in the crossfire. Now I must say this, usually I find sequels to be lack luste Our favorites are back again and things are not what they seem in Damsport. After suffering for months at the hands of boredom, Longinus and Rory find themselves thrust into a mystery that has something to do with missing men and lost black silk. With the life of a very important figure from the Marchioness' past are at stake, the Old Girl will do anything to make sure things are safe. Even if it puts Rory and Longinus in the crossfire. Now I must say this, usually I find sequels to be lack luster. It's a hard thing to do really, especially if the first novel was spectacular (The Bloodless Assassin was spectacular btw). The Black Orchid is a good sequel. It has some things I found fault with but for the most part it was wonderful. Rory and Longinus are back and in this novel everything gets a little bit more deeper and developed. The relationships, backstories and characters, all get a little more developed and a little more mature. Their actions and why they are the way they are, are explained a little more. Longinus acts more like an older brother of sorts and Rory does less to get under his skin. One of the great things about this book and its predecessor is that there's great characters and diverse characters and this novel really brings that to light. There's a ton of great and interesting female characters you wouldn't normally see in other novels and no two female characters are alike in anyway. This novel really does focus on having very cool and very prominent female characters which I love. The writing of the novel is just as good as ever and it seems that there's this brilliant thing going on where Longinus and Rory's points of view are written in accordance to their personalities and mannerisms. Rory's point of very is written bluntly, with very accessible phrasings while Longinus's writing is more elegant, with large word choices. With that being said there's still something missing from this book. It's kind of those things where everything is great but it could be better if just this one little thing was added in. I can't really pinpoint what it is, though. I'm thinking it's because we get less of the Viper the persona and the way Longinus would write his story as he talks, and for me that was a major highlight in the novel. Also there's not as much tension or buildup to the great reveal of whodunit that I thought there was going to be. "The Black Orchid" is fabulous for all the same reasons I raved about "The Bloodless Assassin" (previously "The Viper and the Urchin"). It's marketed as "Young Adult Steampunk" but that classification really doesn't do the book justice. It's a character-drive mystery/thriller that just happens to be set in a fantasy world and is rated PG-13. The background and world-building that bogs down so many other genre books are just set dressing here, plot devices that flesh out the story instead of prop "The Black Orchid" is fabulous for all the same reasons I raved about "The Bloodless Assassin" (previously "The Viper and the Urchin"). It's marketed as "Young Adult Steampunk" but that classification really doesn't do the book justice. It's a character-drive mystery/thriller that just happens to be set in a fantasy world and is rated PG-13. The background and world-building that bogs down so many other genre books are just set dressing here, plot devices that flesh out the story instead of propping it up. The YA tropes, while slightly more noticeable in this second book, are still minimal and not central to the story. The strength of the tale lies in its two main protagonists; the spunky, rebellious Rory and the pompous, dashing Longinus. The pair are the heart and soul of story, not history lessons or codexes on magic or alchemy. Their characters are so large and over-the-top that I feared they may become cartoonish, but Jeanjean has somehow rounded them and added depth without losing the fun and uniqueness who they are. Longinus has grown respect for Rory's skills and recognizes his own faults while still believing the greatest crime in the city is that he can't get a decent bolt of black silk for a new cape. Rory is still fighting for her life and constantly getting into deadly situations but now has to figure out her feelings for boys at the same time. It's silly and wonderful, ridiculous and realistic at the same time, and you can't help but fall in love with both of them. Though the characters and their interactions do the heavy-lifting, the main plot is a mystery about disappearing lowlifes from the city's underbelly, and the appearance of a new criminal organization that appears to be somehow involved. The mystery moves at a brisk pace and hits all the right notes to keep the reader guessing and turning pages. It also comes to a satisfying conclusion while setting up the next (final?) book in the series, no small feat. In short, Ms Jeanjean has penned another tight, sharp and fun book that can be enjoyed from a variety of angles. 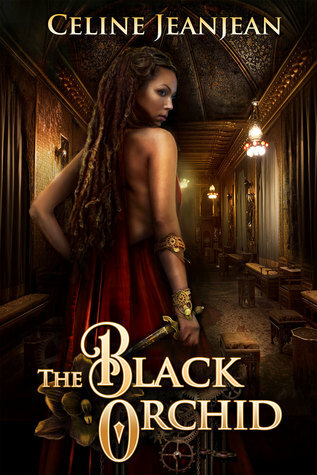 I strongly recommend checking out "The Black Orchid." This is a sequel that I had been eagerly anticipating and I was definitely not disappointed! This is a suspenseful romp through the city of Damsport, which the author introduced in her first novel, "The Bloodless Assassin" (formerly "The Viper and the Urchin.") What to do if you are a bored assassin or rough-around-the-edges swordswoman-in-training? After their last adventure, Longinus and Rory find themselves "honestly employed" with nothing to occupy themselves...which could be dangerous in itself, but then they finally receive a call from the Marchioness. She needs their help to solve a series of mysterious murders and uncover a conspiracy involving her former consort, some smugglers, and a malevolent alchemist! No further ingredients are necessary for a good adventure! I really enjoyed getting to know these characters better. I would say that the characters are my favorite part of the story and I'm glad to see a lot of my favorites back from the first book, as well as some new ones that I'm hoping to see more of in future installments! Although both the main characters are uniquely self-confident, we get to see some of their inner struggles in this book. Rory is growing up, but has her own particularly "Rory-like" way of navigating the "typical" teen struggles. I was happy to get to know more about her childhood and the inhabitants of the Rookery. I really love that Ms. JeanJean has created some wonderfully atypical strong female characters, like Adelma. Last summer, I read the first book in this series, The Viper and the Urchin (now titled The Bloodless Assassin), about an assassin who teams up with a street urchin to solve a string of copycat murders. This book pairs the two of them again, although this time they’re now working for the city-state ruler, the Marchioness – and completely bored out of their minds. The action picks up when the team is pulled in to investigate a murder in a rough part of town. They stumble on a big conspiracy where Last summer, I read the first book in this series, The Viper and the Urchin (now titled The Bloodless Assassin), about an assassin who teams up with a street urchin to solve a string of copycat murders. This book pairs the two of them again, although this time they’re now working for the city-state ruler, the Marchioness – and completely bored out of their minds. The action picks up when the team is pulled in to investigate a murder in a rough part of town. They stumble on a big conspiracy where no one can be trusted, as the body count mounts. Like the first book, this one was great in that I didn’t really predict the ending. The author is great at misdirection; like the characters, you’re not sure who the good guys or bad guys are, as everyone has motives that aren’t completely revealed until the end. Also like the first book, I loved the diverse cast of characters thrown in so nonchalantly. In addition to the rainbow of skin tones, the Marchioness has a female consort that no one bats an eye at. I’d love to see more books follow this path of mirroring the diversity found in the real world. It also touches on class issues: are certain people expendable based on their role (or lack of) in society? What happens when classes mingle – is it okay socially? Will both sides be able to accept each other, or will there always be the urge to change one of them? How fluid is class, and what happens when you move into a new one? The Black Orchid focused as well on relationships: the one between assassin Longinus and street urchin Rory, between Rory and a nobleman working in the Marchioness’s guard, and between the Marchioness and her longtime consort. The second adventure of the Viper and the Urchin finds these two disparate characters relocated to the warehouse of Cruikshank, engineer to the Marchioness, no longer an assassin and a pickpocket, but officially employed by the Old Girl, as the Marchioness is affectionately called. But their services have not been required and they are feeling aimless and redundant when at last they are summoned to investigate a mysterious death by exsanguination in the insalubrious Bayog district of the city of The second adventure of the Viper and the Urchin finds these two disparate characters relocated to the warehouse of Cruikshank, engineer to the Marchioness, no longer an assassin and a pickpocket, but officially employed by the Old Girl, as the Marchioness is affectionately called. But their services have not been required and they are feeling aimless and redundant when at last they are summoned to investigate a mysterious death by exsanguination in the insalubrious Bayog district of the city of Damsport. Like the first book, The Black Orchid engages readers by the strong, vibrant women who never give up against all odds. An old relationship between the Marchioness and stunningly beautiful Mizria may be reawakened, Rory seems to becoming closer to Varanguard, Rafe and Longinus continues to send anonymous poems to Lady Martha, daughter of the Old Girl. Rory and Longinus are bored living an honest life. But when an old friend of Rory's from her urchin days turns up exsanguinated, Rory and Longinus set off to investigate, through the poverty and illegality of the Rookery, to the opulence of The Mansion and its inhabitants and visiting diplomats, to the brothel Second in The Viper and The Urchin series, though can easily be read as a standalone, this was steampunk at its best. There was intrigue, adventure, mystery, alchemy, and a dash of romance. Wow. The plot had me turning (OK, swiping) the pages as quickly as my reading would allow (I think I forgot to eat dinner at one point. What day of the week is it?). The characterisation, too, was so wonderfully written, with the characters interacting and growing as the book progressed. There was pace and immersive setting and... Just read it - it's brilliant. More fun adventures from Rory and Longinus!! After their heroic achievements in the previous instalment, the unlikely friends are living with Cruikshank and working for the Marchioness. However, stability isn't these crazy kids' favourite word, and soon enough they'll be involved in another adventure. I thoroughly enjoyed the second book in the Viper & Urchin series. The characters are as imperfect and endearing as ever, which is in my opinion the author's greatest talent. The descriptions are rich and detailed and the storyline is very griping. I'd definitely recommend starting with book one of this series. Though the stories are standalone adventures, getting to know the characters and their relationship in The Bloodless Assassin just makes this one so much better. I loved this book. It is a fantastic adventure with lots of humour and nail-biting tension. And such an expected twist at the end. Brilliant stuff. So glad I found Celine JeanJean. She is definitely one of my favourite authors. I love this series! They are incredibly well written character-driven books. I love that the characters are always consistent and real, and that they can show growth while still being themselves. Can't wait for book 3! Continued to be humorous adventure. Quite entertaining. Nice fluffy series. I enjoyed the first book enough to buy this one. Jumped the gun a but on some character development, but I enjoyed it. Celine writes stories that feature quirky characters and misfits, and her books are a mixture of steampunk, fantasy and humour.